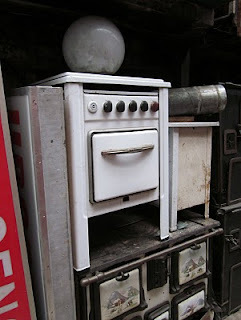 Really, how dare I call this a weblog when I haven't posted in over a month? Ceci n'est pas un blog. Call me Mme Magritte, but please do forgive my dilatory epistolary something-or-other. Okay, it really is a blog, but it doesn't appear to be so at times when nothing has been posted. Right? 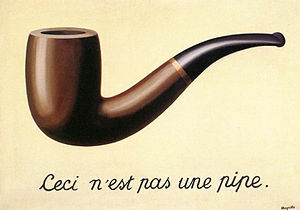 It's so very Magritte of me, n'est-ce pas? Nom d'une pipe! I've been on the move. Polly-Vous Francais is now an official denizen of -- ta-dah! -- the Big Apple. Stayed tuned for updates from the flaneuse of the streets of Manhattan. Labels: blogging, chez moi, where am I? 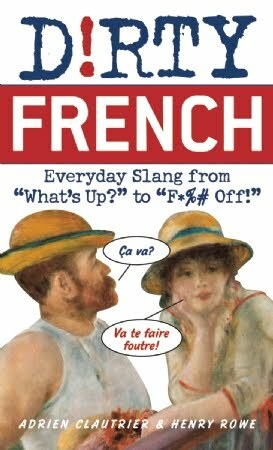 French Phrase Books: Slang? Colloquial? Miss Bee, bless her darlin' heart, just spent an academic year -- or is that "academic" year? -- in France. I dare say her French got more fluent. She was a language assistant at a French lycée through the wonderful French Government program. But as is the case with many young people who have fun carousing with their French peers, the language skills she acquired aren't necessarily 100% fit for polite company. The Berlitz-type phrase books didn't really give her a leg-up in conversing with other 20-somethings. On the other hand, the slang dictionaries didn't exactly help in terms of understanding the appropriateness of the language. Recently, Miss Bee has acquired Merde! The Real French You Were Never Taught at School. This phrase book, she says, is imminently more practical and useful. It gives ratings as to appropriateness of all those phrases she learned and parroted back. Basically it gives you a rating scale of social context between being polite and bien élevé, a dweeb and having a gutter mouth: very important distinctions when conversing in France. Good to know. Any other recommendations? Ah, the fates can be cruel. That initial part I can deal with -- dashing from Terminal 1 to Terminal 2E in a window of 2 hours. God willin' and the crick don't rise, I'll make it. But the return flight is what pains me. My flight arrives mid-evening into Roissy. The continuing leg to the U.S. departs the following morning, about 12 hours later. That, to me, is sheer temptation. Sheer torture! How can I be in Paris and not be in Paris?? Could I navigate my way into Paris, arriving after the dinner hour, and (ignoring seeing friends, alas, which would give me no time in the city), stay in a little hotel and spend my evening walking around -- being my old flaneur self -- and get enough rest and time to rise, check out, find transport and reach the airport in time for the return flight by 11 a.m.? 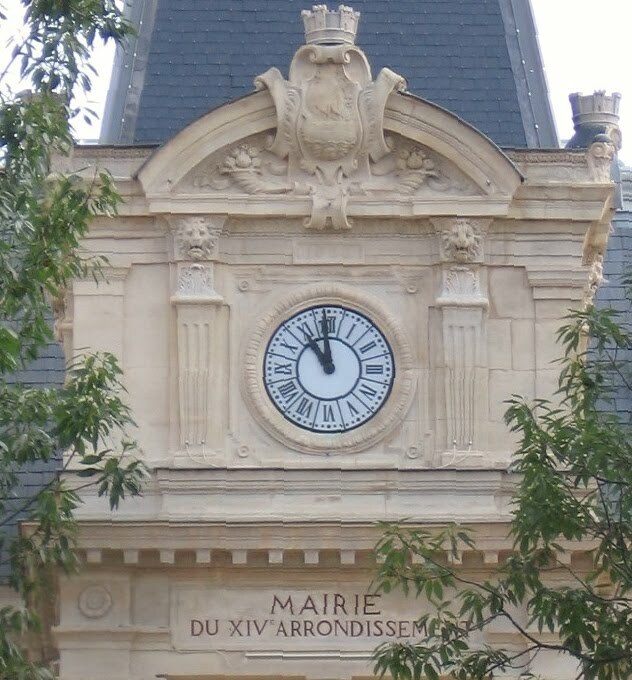 I surveyed my friends -- their suggestions ranged from "stay at the SofitelCDG," to "stay in the 6e near the RER station," to "the Ibis CDG," to the myriad other hotels at Roissy. First I opted for taking the Air France car to the Etoile, staying in a small 2-star hotel, and hitting the town. Then I got real. If I didn't arrive until 10 pm, lugged my luggage to the room and then went out wandering, it would be a rather stunted visit. 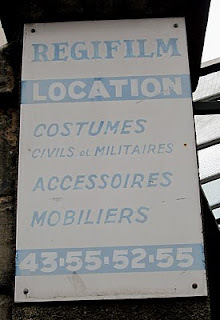 And forgive me, but I really despise traveling on the RER from CDG with luggage, so that option had already been nixed. So, I have decided to do something I've never done before in my Paris excursion adventures: I'll stay at a chain hotel at CDG and explore the airport itself for, um, entertainment and edification. Any recommendations? Where would you stay -- what would you do -- what would you like to know about -- with 12 hours to kill at Charles de Gaulle Airport? Dining, lodging, spa services, entertainment, budget ideas? I'll report back in a week or so. These days we all have our travel horror stories: baggage lost, flights canceled, endless lines upon endless lines. Security itself is worth tomes. A friend's recent saga reminded me of a most unusual moment in my early traveling days. By the time I was 10, my parents were divorced and living in different states. We kids became troupers in air travel, shuttling from Tennessee to Pennsylvania without batting an eye. In the 1960s there was a cheap stand-by fare for the under 21 crowd, and we became pros at mastering the take-offs and arrivals. Getting adoring attention from the stewardesses. One summer in the late 1960s, though, my sister and I had a most remarkable air travel experience. I was 13, she was 17. We were flying one evening from Nashville to Philadelphia with a connection at National Airport in Washington. En route to D.C., we were in the middle of the most horrific thunderstorm I've ever experienced in the air, before or since. Huge thunderbolts striking down on all sides, and our prop plane was bouncing like a superball from one air pocket to the next. After a terrifying descent, when we finally made it to terra firma, I was happy to be alive. Then, we were told that our flight to Philadelphia was cancelled. Due to our "youth stand-by" status, the airline wasn't required to give us lodging or any other compensation. We spent our coins in the pay phone to call our mother, who couldn't really help us much. Yikes. Two young teen girls alone for a night at Washington National? That was almost more spooky to me than the turbulent flight. 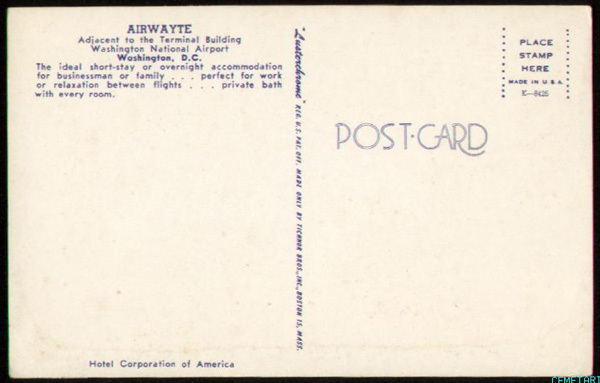 We went to the airport hotel, the Air Wayte. They were booked, of course. We pleaded with the front desk clerk. Clearly, here were two nice girls in their Villager outfits properly dressed for travel; surely they couldn't leave us unchaperoned to walk the halls of the airport -- or sleep unprotected! -- for a night. (Remember, this was before airport security or cell phones...) The manager was summoned. He was scratching his head, trying to figure out how to help the stranded waifs. Finally, he said, "Well, okay. I guess I could put you girls up in the Towah Room." I heard "Tower Room" and naively envisioned bunking down on the sofas of a cushy top-floor lounge. Sounded good to me! My big sister accepted, so off we went. To.... the third floor linen closet. The Towel Room. He wearily told us to make ourselves comfortable in the 4X6 foot space, and shut the door on us. Pioneers to the hilt, we padded the floor with every towel from the shelves, spread out clean cotton sheets on top, settled in; and ah, did we fall asleep? No, because it was also the supply closet, and we found an ample repository of Air Wayte Hotel postcards and a few ball point pens, and so spent much of the night scribbling notes to our friends. "Guess where I am? I'm spending the night in the linen closet of this hotel!" All in all, it was a heavenly evening (except for a few scurrying cockroaches) where we felt both totally safe and totally outrageous. We left with great gratitude and an unnecessarily large amount of miniature bars of individually wrapped hotel soap. 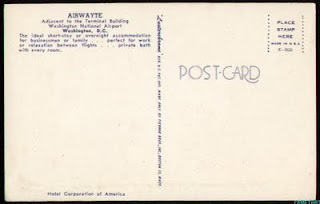 Thanks, Mr. Air Wayte, wherever you are! 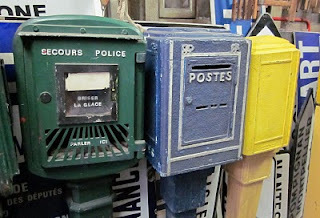 Postcard image via La Dolce Vintage. 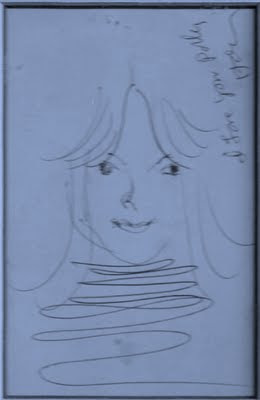 I just uncovered this quick ball-point sketch of me when I was about 13 or 14. It brings back such wonderful memories. 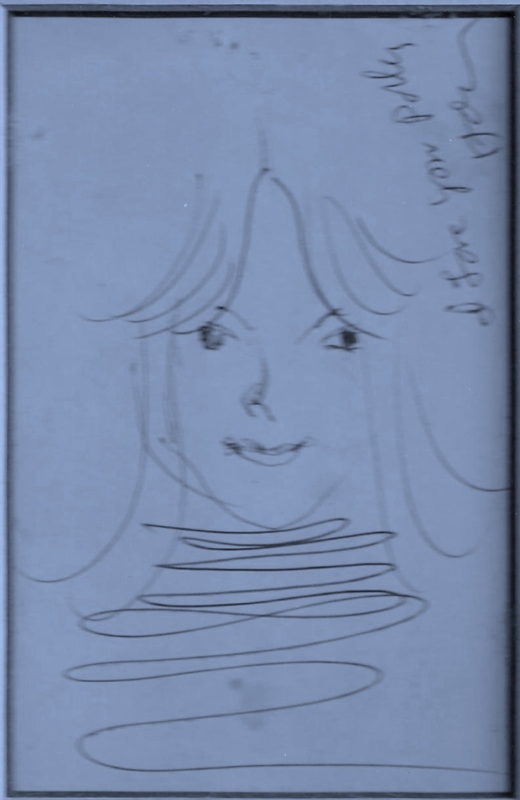 I can't even remember the artist's name, yet he signed the sketch "I love you, Polly." What more could a teenager want? Here is the scenario. I was the youngest of five children, and by the time I was a young teen, all of my siblings were off the social radar screen: Saturday night rolled around and they were away at boarding school or college or hanging out with the high school In-crowd in Philadelphia. Which left Polly and the parents. Social beings that they were, dinner parties were a frequent function. When those gatherings were chez nous, I was expected to join the adults at the table and be conversant, polite, and charming. I don't know how I measured up, but I know that it helped me learn to love dinner conversation, candlelight and starched damask napkins. The clink of silverware against china. Engaging in dialogue with adults, and having an opinion about current events. I remember well the evening. My dinner partner -- a man my parents' age -- treated me as if I were a fascinating adult. I shared my naive views on politics and culture, and he responded with aplomb and appreciation. I blossomed. I was treated as a grown-up! Right there at the table, he asked, "May I sketch you?" And so we giggled conspiratorially and temporarily ignored the other guests for a few minutes while I found a Bic and some paper and he whipped up this sketch at the corner of the dinner table. Suddenly I no longer felt like the baby brat of the family, but a privileged participant in a grown-up world, even though I was wearing a cotton A-line skirt and a striped Skyr turtle-neck. I've kept the portrait to this day: an important reminder. I wish I could remember his name to thank him for the transformational moment. So, what does this have to do with my love of France? Perhaps everything, perhaps nothing. I know that when I first spent time in France a few years later, it felt so natural, so elemental, to be reveling in dinner conversation. It still does. I don't know to what extent my own children have learned this joy of inter-generational socializing. In France -- at least among my French friends -- this still is the norm. All ages gather at the table and get along (or not!) with verve. A few years ago I was sitting with a friend in Paris who was feeding her toddler in his high chair. She said, lovingly, "Tiens-toi comme il faut," and made sure he sat up straight, before giving him the next spoonful. He giggled and clowned and wiggled, then sat up tall for his next bite. Then smiled and batted his eyes at us. 1954. In the olden days, in order to see everything at a show -- whether the theater, opera, or a sporting event-- one needed to hold binoculars up to one's eyes. No more! Give your wrists and elbows a rest. 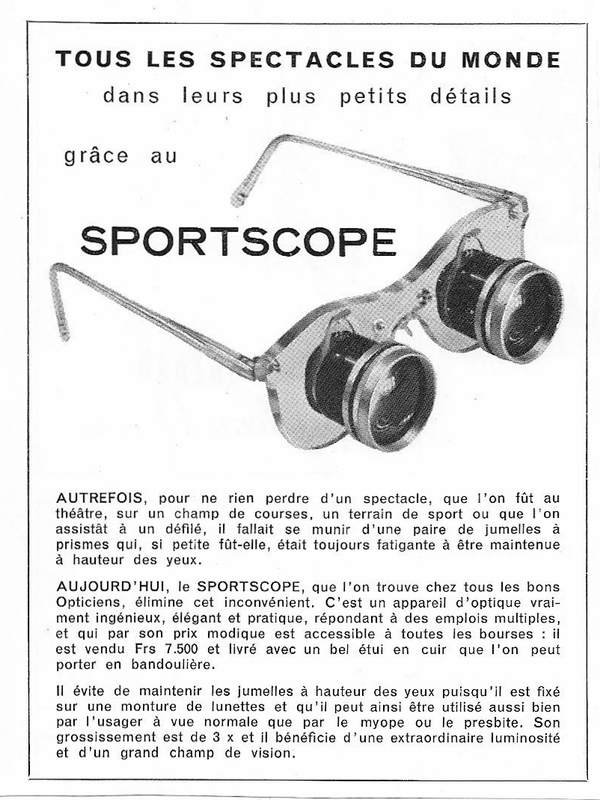 Just sport a dashing hands-free Sportscope (available at all the best Parisian opticians). 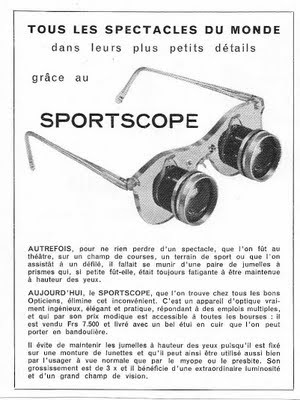 Contrary to what you might imagine, this advertisement wasn't on the back page of a Marvel comic book but in the uber-upscale magazine Plaisir de France. As a lifelong student of the French language, I've always appreciated the French names of places in the United States. Some are better known than others, albeit with Americanized pronunciations. One of my favorites is Picketwire. From the French "Purgatoire," Purgatory. 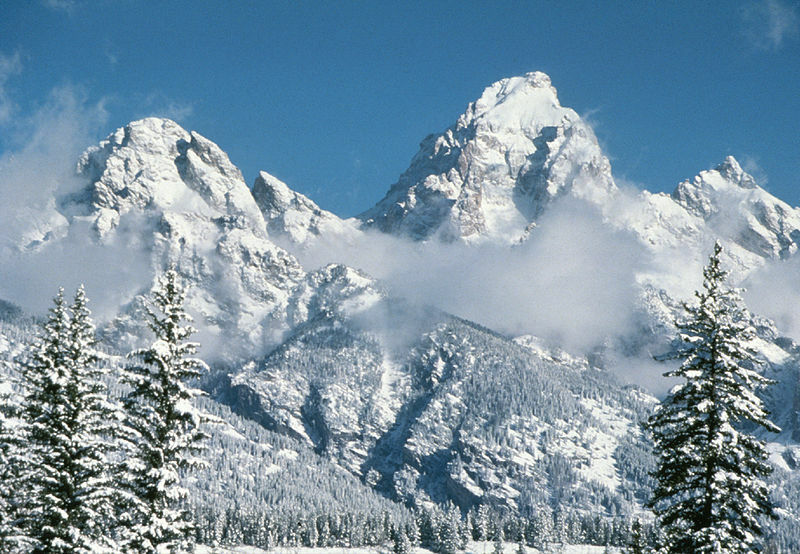 And, so verrry French: The Grand Tetons. Go ahead, take a look at the beauties in this photo and try to convince me that the mountain range was NOT named for the French phrase for large mammaries. Some claim that that interpretation of the origin of the name is "controversial." Too much tittering about it, I guess. I'm not fooled. What are your favorite French place names in the U.S.? P.S. By the way. 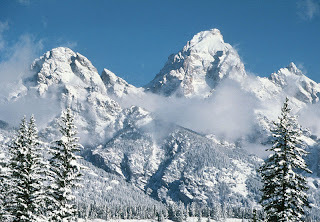 Hey, Wyoming, you wonderful state: how about a little more blog-love? Je vous adore, and not just because I'm envious of the grands tétons. Images via Wikipedia and Clustrmaps. Plaisir d'été. One of life's simple pleasures. Summertime and a little apéro. 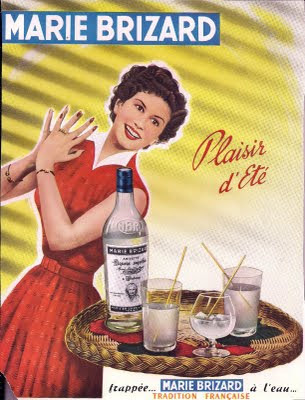 I was delighted to see that Marie Brizard, this anisette aperitif, still exists. Since it's been around since 1755. I am quite a regular at the local French take-out place next door to our school, Cafe La Tartine. Today I ordered one of my standards, "Half a Pan Bagnat, no onions, please." Without being asked for elaboration, I of course offered it amply anyway. Hmm. Does my reputation precede me? 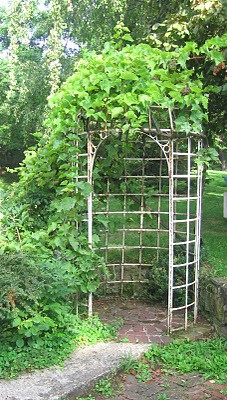 Origin: Provence. I regaled them with stories of my junior year in Provence, and the way a pan bagnat was served there (not in a baguette, but in a big hollowed-out round of bread, pressed and sliced). Back then, it was a budget-minded student's dream come true for an all-in-one meal. Salade nicoise in a bun, kinda. 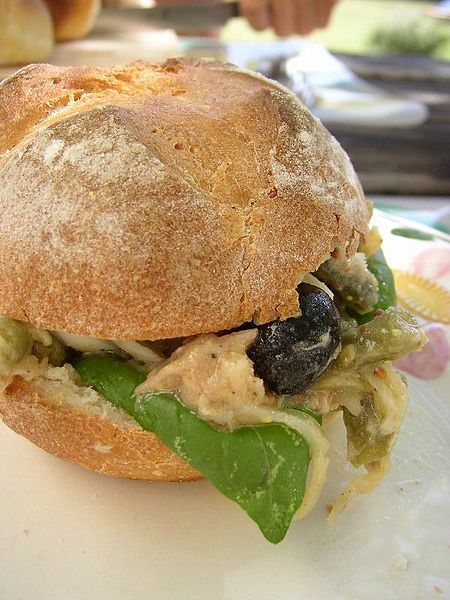 I found a great pan bagnat recipe in the New York Times. My favorite part? "Put sandwich under a weight such as a cast-iron frying pan topped with a filled kettle, or have a child about 7 years old sit on it." That just doesn't sound like much in English, does it? 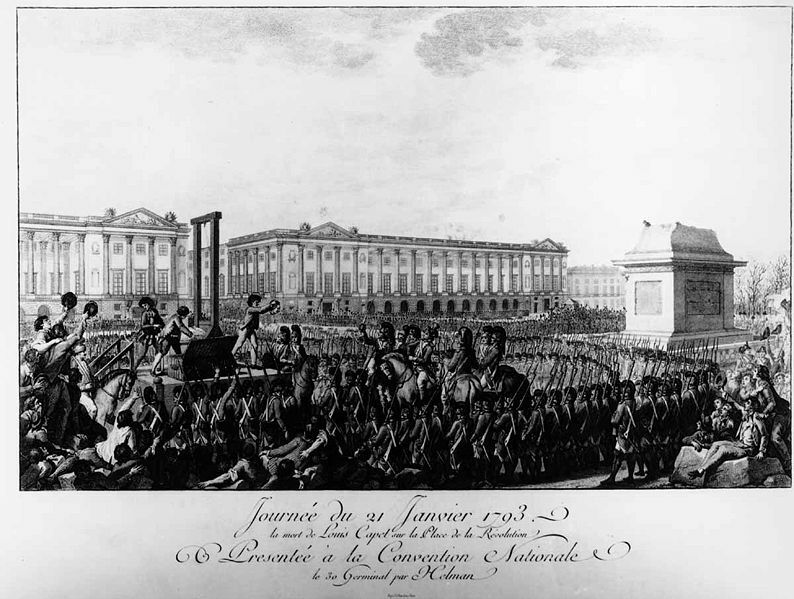 So we francophiles toss around "Happy Bastille Day." That sounds festive. 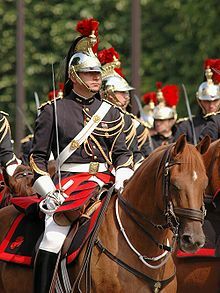 One of my favorite parts of le 14 juillet in France is watching the défilé militaire down the Champs Elysees in Paris. I've never had the right connections to get a good parade-viewing seat, and so have always relied on watching it on television. How utterly different from an American July 4th parade, with the shiny old fire trucks and home-grown, home-town floats! The military splendor of soldiers marching, the overhead patrouille of aircraft. Two full hours of formal regalia. Thrilling to the bone. 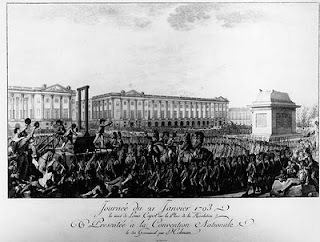 One of the cultural ...um, adjustments I had to make when I lived in France was realizing that France doesn't celebrate July 4th with the same exuberance that the US celebrates Bastille Day. A few festive or commemorative gatherings here and there, to be sure. But, I wondered, do the French realize how much Bastille Day is a major party in the US? From Boston to New York to San Francisco to many towns and cities in between, Bastille Day is a major cause for celebration in the streets. Don't take my word for it: google it and find out for yourself. And as much as I adore and admire David McCullough, I think he underestimates the American celebration of Bastille Day in today's New York Times column. Please read his wonderful The Greater Journey, the stories of some remarkable Americans in Paris in the 19th century. Totally engrossing and riveting: buy it today if you haven't already. 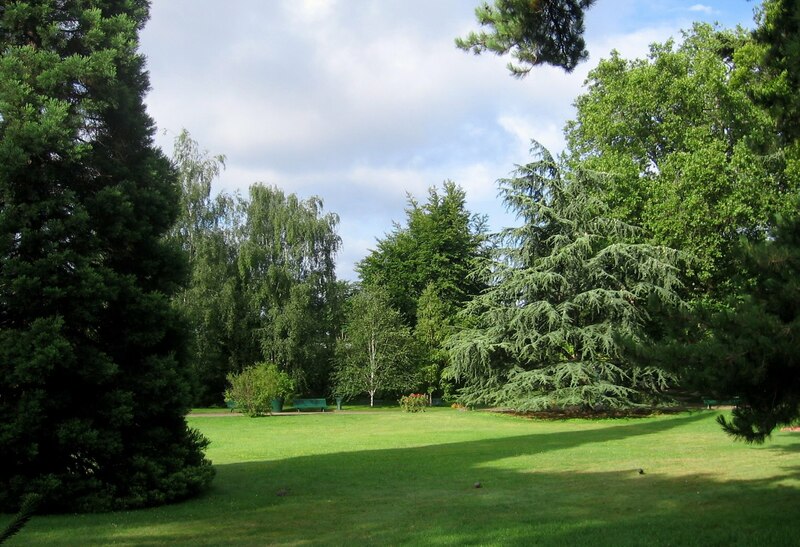 For this American francophile, Bastille Day in the US means afternoon petanque in Golden Gate Park, and evening champagne with some French dignitaries, while the rest of San Francisco whoops it up into the wee hours with lively wine-filled festivities. We may not have the feu d'artifice, but man, we Americans DO celebrate July 14! This flyer just arrived in my mailbox from the folks at MaidPro. Surely a coincidence (ha!) or surely NOT a coincidence in timing? "The wrong maid is an accident waiting to happen." 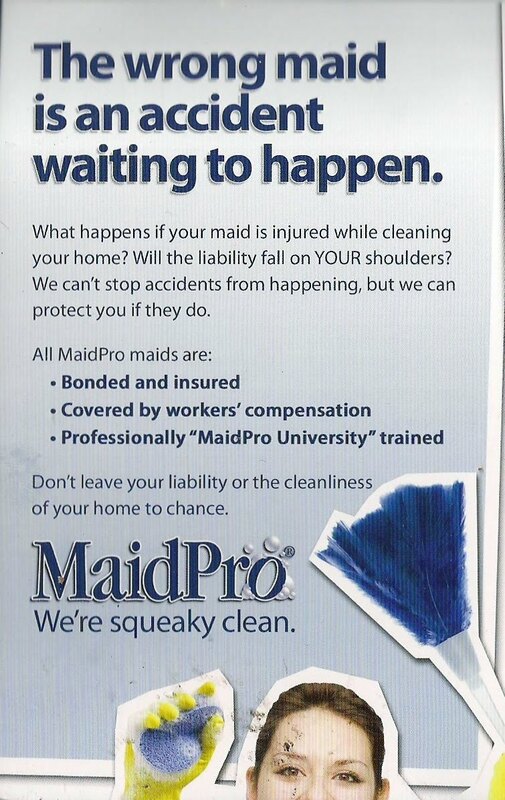 "MaidPro -- We're squeaky clean." And their other motto: "Talk dirty, live clean." Fresh new banner and font! Bof. I was getting bored with the old one. Who is the Parisian male? 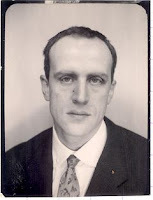 THE PARISIAN MALE…Who is he? Where does today’s Parisian man go for nightlife, to dine, for entertainment, or to shop for clothes? Of course we are all salivating to know the answer to these burning and relevant questions. Aren't we? Through its annual survey, Le Figaroscope a few months ago offered a quick sketch of the typical male denizen of Paris: "at once perfectible but seductive, snob yet distinguished, lighthearted yet erudite." The survey had some interesting responses: the vote came in for the handsome and talented Edouard Baer as the icon of French male-ness. Can't argue with that. And details of his favorite haunts and habits are spelled out for you. 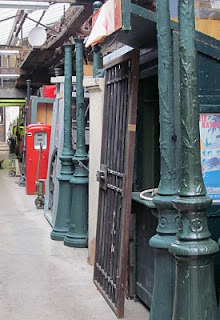 Even if your French isn't le top, you can read the article here and find out the cool, hip places to be a man in Paris. And statistics about the runners-up. Ah, then the tables turn! None other than Inès de la Fressange opines in the article, offering her view of the typical Parisian man. I didn't want anyone to miss this, so I translated it all for you. • never sees high chairs for the baby in restaurants; but since he isn’t Swedish it doesn’t surprise him. Eh, oui, those fascinating, inscrutable Parisiens! 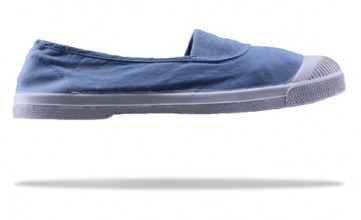 Bensimon shoes, to me, have always been the quintessential French laid-back summertime shoe. Pronounced benn-see-mohn, the canvas shoes with rubber soles have long been an understated favorite of the sporty summer crowds in all the right French vacation spots. They have always been cool. A French friend once clad all the young children in her daughter's seaside wedding (NDLR: no frou-frou grown-up bridezilla bridesmaids at French weddings, just adorable little kids!) in sailor suits and shod them in Bensimons. Of course it was totally perfect and chic in the most Côté Ouest kind of way. Can you imagine an American wedding filled with kids wearing, essentially, sneakers? Not on your life! This was totally charming and comme il faut. I got my first pair of Bensimons on a summer vacation in France, on Île de Ré. 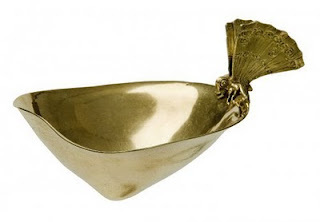 So practical for toodling around the village, going to the marché, and oh, if you get invited to go boating, you're all set for maneuvering nimbly on deck. Then I brought them back to the U.S., and they seemed.... too casual. Frumpy, almost. There was zero recognition of their coolness. To some they looked like old-lady slip-on sneakers. But like my love affair with espadrilles, I ignored the social sartorial stigma and wore them with pride, knowing that I was in the know (shoe-wise) an ocean away. Back in Paris, I became smitten with the Bensimon boutique in the Marais. Everything about it shouted "Ahoy, monsieur! Take me sailing in Brittany!" Rugged canvas jackets, khaki rubber-soled shoes, all with such clean, spare lines, You could practically smell the briny Atlantic air. Fast forward to 2011. If you haven't heard, Bensimons are HOT-HOT-HOT fashion items these days. Darlin' Miss Bee brought a pair of pink lace-up Bensimons home from her year in France, and has been proudly wearing them around town. She is such a fashion trend-setter that I knew she was on to something. Then while perusing the stacks of celebrity magazines at my dentist's office waiting room today, I came across two separate articles touting the glories of Bensimons. Yes, they are the rage with Hollywood stars. Zut. I always liked being in a small group of fashion insiders. No more. The good news is that Bensimons are available on line in the US via Bensimonusa.com And shipping is free. The price is a little more than you'd pay in France; but, factoring in the cost of a plane ticket that you don't have to buy, well worth the price. And don't go for cheap imitations. The Bensimon cognoscenti will know the difference. I settled into my cinema seat and waited impatiently through the coming attractions for the feature film to begin. 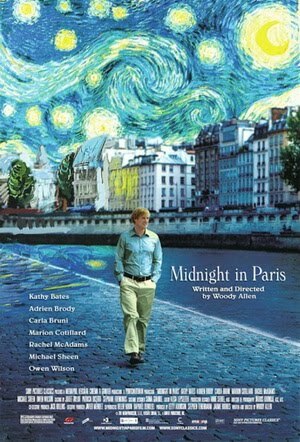 Ready for my Paris fix by watching the much-discussed Midnight in Paris. The film began, with the brassy, jazzy trumpet music playing over the familiar sights of my favorite city. Everything seemed too yellow. “Woody Allen got it all wrong, “ I was thinking. I am way too possessive about my Paris knowledge. “Is he trying to make it look like Kodachrome or something?” I was fuming just a little. “The light in Paris is silvery, not gold. 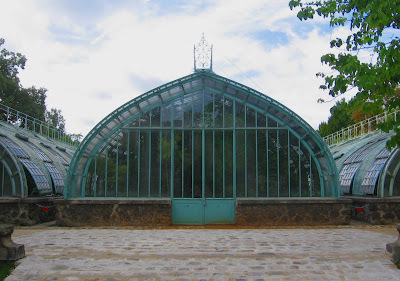 The buildings are soft grey, and he is trying to make the buildings look as if they are all made of sandstone.” Even the gold leaf on the fountain at the place de la Concorde was too shiny, and the verdigris was too green. The wet nighttime streets should be reflections of pewter and chrome, not glimmers of gold. It wasn’t MY Paris, in any case, I harrumphed inwardly. What was he thinking?? It’s occasionally truly obnoxious to be in the role of “I used to live in Paris.” This was no exception. I tried hard to suppress my oh-so-superior knowledge of the settings. Especially since Woody had gone so overboard on the gold. His shots of the admittedly posh Le Bristol seemed over-the-top in the gilt and gold-plate department. I didn’t get it. But soon enough I was ensconced in the plot, and the cinematographic details took a back seat. I did, however, almost jump out of my seat and hissed loudly to Bee, “That’s DEYROLLE!” In the scene with the champagne-soaked party surrounded by taxidermied animals. “Drole?” she whispered back. “D-E-Y-R-O-L-L-E! Deyrolle, my favorite taxidermy store!” I was beside myself. I hate people who talk in movies. As the movie progressed all I could do was admire Woody Allen's brilliance. This film was a magical modern-day fantastic tale interwoven with "The Kugelmass Episode," Back to the Future, and Grimm's "The Twelve Dancing Princesses." Then, at one point, Owen Wilson's and Marion Cotillard's characters were in deep conversation about what it means to live in a golden era. One's nostalgia for a more golden era is sometimes missing the point that the golden era is actually the present. "Ah," I sank back in my seat. The golden-yellow light of Paris was brilliant, Mr. Allen. Labels: arts and entertainment, literature, where am I? French singer Maxime Le Forestier perhaps singlehandedly put San Francisco on the French contemporary cultural map in 1973 with the recording of his wildly popular song "La Maison Bleue," known to most as simply "San Francisco," a tale of a summer spent in San Francisco in 1971 in the time of peace, love, and flower children. Then, last September, an enterprising San Francisco/Parisian journalist who grew up "singing this song in the shower" tracked down the actual location of the Blue House. And now, dear beloveds, Maxime Le Forestier is returning to San Francisco to sing for us all, on the 40th anniversary of that fateful summer in San Francisco. He will be performing on Friday June 24 at the Herbst Theatre. Ticket information is here. I think the phrase "once in a lifetime" is not an exaggeration in this case. And needless to say, the SF French and francophile community is quivering in anticipation. Me included. A few anticipatory participatory sing-alongs are planned. But of course! First, a guitar rehearsal on June 17 at NPG studios on 18th street. Then, for a broader sing-along audience, a French pique-nique potluck at Dolores Park, weather permitting, on June 22. Just to get in the spirit of things. For specifics on either of these, contact Christine at christine [at] appletopomme.com. Of course, I'll report back about the actual concert. But you knew that. UPDATE: concert canceled due to visa difficulties. I recently came upon an issue of Paris Match from May 27, 1950, a yellowing 61-year-old chronicle of la vie Parisienne. Think about it: just 6 years after Paris was liberated. When my scanner is back in order (long story), I'll include some of the great vintage ads and visuals. Meanwhile, I feel compelled to report on a Paris briefing found in the end of the magazine. 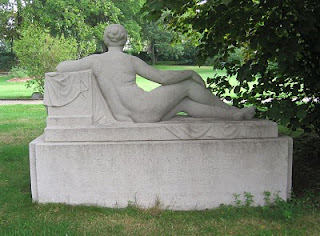 Entitled "Elles et Eux," written by Cecil Brunet, it is a compilation of tidbits: social, literary, political. Here are a few random selections (translations by me). A glimpse beyond the cliche-ridden images of Paris in the 1950s. Bing Crosby, who had settled in to the Ritz upon arrival in Paris recently, found that hotel too noisy and left it to stay in the Lancaster. He then left the Lancaster, and found an apartment in Auteuil. Paul Claudel, replying to an actor who was praising him for the dialogue in his work L'Otage, said, "Well, what do you expect? It's Claudel!" Charles Trenet will sing in Central Park in New York on May 20. When he enters the stage, 40 New York policemen will give him a grand salute. This idea amuses Trenet no end, as this will be the anniversary of his detention on Ellis Island. Gaston Gallimard, looking at the crush of people gathered at his cocktail party, said "It's amazing how many friends I have!" Sartre had written a letter to a judge in support of Boris Vian, to address the legal action between Vian and the Cartel d'action morale. The letter didn't arrive in time, and Vian was found guilty. Polly-Vous Francais on the Airwaves! Polly-Vous Francais is silent no more! If you'd like to hear my real voice live, tomorrow is your chance. On Saturday May 21, I will be the guest on the radio program "Franco Fun" on KUSF in Exile in San Francisco, at 5:00 p.m., Pacific time. Every Saturday, DJ Fari provides a weekly francofix for Franciscans and francophiles around the world with the program Franco Fun, featuring music, lifestyle, culture, and interviews. And this week the feature is moi. Some in English, some in French. Tune in! I was originally scheduled to be on air in January, but five days before show time, the University owners in a surprise move sold the station's air rights for a cool $3.75 million without any advance notice. (I always have impeccable timing, n'est-ce pas?) So KUSF is now live-streaming here. If you have requests for music, let me know ASAP. 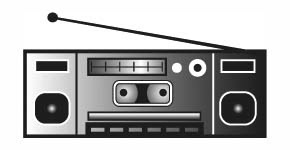 Featured guests are asked to BYOM (bring your own music), and my CD collection of French music tends to the classic crooners: Maxime Le Forestier, Serge Gainsbourg, Georges Brassens, etc. I could throw in a few brief comedy sketches like Franck Dubosc, Florence Floresti, and Sylvie Joly if there's time. An hour is pretty short, especially with all the yakking I'll be doing. What music would you like to hear? What questions would you like DJ Fari to ask me? Any shout-outs (within reason)? Murder in Paris: How About You? Have you always longed for a sliver of immortality? Do you especially dream of that immortality intersecting with Paris? Well, here is your chance. Acclaimed author Cara Black, of the Murder in Paris series, has generously offered to name a minor character in her next novel -- for a good cause! The French American International School in San Francisco will offer to the winning bidder at the school's annual fund-raising auction on May 7 the chance to be a minor character in Cara's next Paris-based novel. The kind of immortality that normally one just can't buy. Interested parties who can't attend the event can bid by proxy. The juicy details: the character might be murdered or maimed, or might be the snitch or the all-seeing neighborhood boulanger or concierge. The only disclaimer is that the name needs to be French or willing to get Gallicized. "John" would become "Jean," for example. "Polly" would be.. hmm. Pauline? Poulette? I'm working on it. The fame, fun, and glory? From the magazine Plaisir de France, 1947. 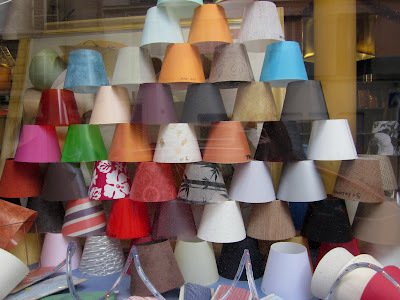 A selection of French designers' (modistes) Easter hats. Legroux: a capeline (broad-brimmed hat) covered with irises. 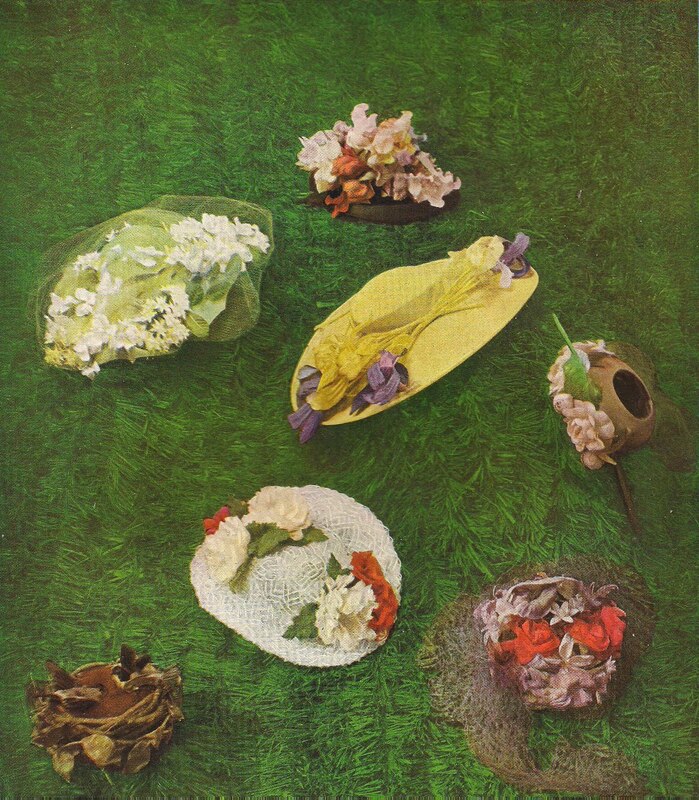 Jane: a felt hat pierced by a stem of camelias. Gilbert Orcel: a straw hat veiled in mousseline. Rose Valois: a toque with multicolor flowers. Schiaparelli: a bird's nest, a bouquet of sweet peas, and a straw hat decorated with poppies. A new friend – someone I met at a dinner party a few weeks ago – emailed me the other day to follow up on our recent conversation. She and her husband are going to Paris next September, and I had offered to give them some ideas for their one-week stay in my Favorite City. Maybe it was because I was still nursing my first cup of coffee when I replied, or maybe it was – well, who knows? – but I found myself extending a bit of advice that I’ve never mentioned before. Ah, memories. I was so woefully shoe-inappropriate when I first moved to Paris. I cringe to think about it. On earlier extended visits before the Big Move, I had bought shoes in Paris, last minute, to try to blend in. I had such bad new-shoe blisters that I couldn’t shuffle across a street. Then, idiotically, before moving to Paris, I got rid of the shoes I should have brought with me. Once I arrived I wore shoes that I thought were acceptable which got disdainful stares. Suffice it to say that I arrived in Paris laden with seven suitcases and a huge case of shoe anxiety. It’s all relative. For example, within my first weeks living in Paris, I met up with an American pal, a friend from high school, who had been married to a Frenchman for 20 years. She was wearing running shoes and jeans when we met for dinner. I gasped. “But, M, that looks so… um... American!” I had said. “I am American,” she quipped with total confidence, proudly displaying her Nikes and sports socks. So, I initially tried a variation of her proud-to-be-an-American footwear bravado, sporting a pair of black Bally sneakers in my daily walks around the city. I found that the designer sneakers were vaguely acceptable (that is, they didn’t meet with open derision) if I kept walking; but if I stopped to have lunch or shop some place that was respectable, I instantly had a sense of fashion faux-pas. Shopkeepers addressing me in English, despite my perfected “Bonjour, Madame” greeting. I kept trying to learn. You see lots of stylish French women in impossibly spiky stilettos or mile-high wedges gliding down the sidewalks of Paris, it's true. But I learned a trick from an uber-Parisienne colleague: two pairs. She wore her incredibly stylish but comfortable heels for hoofing it across the Seine. Then, just before the business meeting where she needed to charm the Big Guys, she stopped, sat down outside the building, and changed into her most dangerously feminine shoes or little wobbly bootlets, for maximum effect. It worked like a charm, every time. I was in awe. Another time, I was determined to be a total Parisienne with my footwear. I bought a pair of Dior pumps because my glamorous friend, Marie, who is an honest-to-god French countess, had the same pair. She always looked chic and hip and wore her Dior pumps with blue jeans or a slim skirt or a dressy outfit. Would it transform me? Guess what? 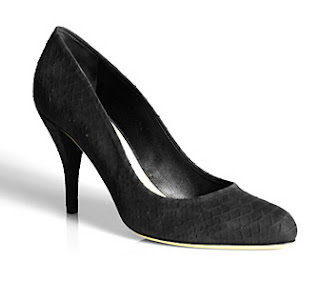 I ended up wearing those expensive copy-cat Dior pumps exactly once. I later sold them at a US consignment shop to a former Miss France. Don't ask. Lesson learned. As a casual visitor to Paris, of course you need not go to such extremes. But wearing shoes that are appropriately sophisticated will make you feel more at ease. For practical yet chic shoe staples, I eventually settled on a pair of black mid-heeled boots, some nice Italian leather ballerina flats, and a pair of loafers that could have been (but weren’t) Tods. Friends have also recommended Cole-Haan’s Nike Air-soled shoes. Moral of story (if there is one): Paris is a sophisticated city. It is also a walking city. My advice: wear footwear that is sophisticated and comfortable for maximum enjoyment. 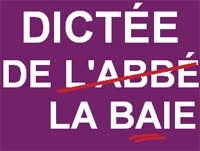 Poisson d'avril, as you may know, is the French equivalent of "April Fools." While taping a paper fish to someone's back isn't the essence of hilarity, what the heck. But my favorite French funny-fish story bears re-posting. It actually took place at the plush Cercle de l'Union interalliée in Paris the last time I had lunch with the wonderful late Polly Platt. Polly had her back to the couple and missed all the action. In a large sky-blue dining room with 25-foot ceilings and a hushed atmosphere, a kindly American couple sits primly at the elegant table nearby, scanning their large white menus through their reading glasses. The waiter returns to their side, and with a short bow he flourishes the answer to the question they had asked which had sent him scurrying. "Eet is 'goldfish'," he announces. "Goldfish?" Startled, the husband and wife look at each other in disbelief. They shake their heads and hastily dive back into their menus to find another selection. I return to my menu to make my choice for lunch. The poisson du jour is rouget. I awake in the pre-dawn hours, befuddled and anxious. Will our family have enough to eat? I wonder. Will we reach Tours? Will it be safe when we get there? Then, slowly I awake. I rub my eyes and realize it is 2011. I am safe in my comfortable American bed. Breakfast awaits. As I gaze sleepily around the room, I remember that I am reading, and totally absorbed by, Suite française, by Irène Némirovsky. 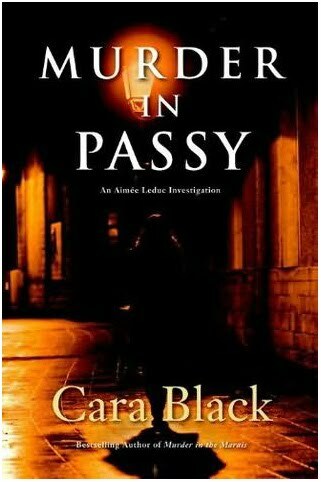 Published in 2006, it's one of those books I'd been "meaning to read" and couldn't decide whether to read it in French or English. If it's one of those books that you have been "meaning to read," please do so. I'm reading the English edition, exquisitely translated by Sandra Smith. Universal Studios apparently bought the movie rights in 2006. I don't usually clamor for a great novel's film version, but this is one that I can't wait to see. It is also one of those books that I want to know the ending of but that I don't ever want to end. Does anyone else besides me remember the names of every French teacher they ever had? I recall each one: Madame Rhodes, Mademoiselle de Mauduit, Madame Lambert -- too many to list -- all the way through college. And believe me, their names and voices and red-pen marks came rushing back to memory today as I climbed into the seat to compete in this year's Dictée de la Baie, more or less the French/francophone version of a spelling bee. There were 150 contestants from the Bay Area, ranging in age from 6 to over 60. In the category Adult Francophiles, there were about 20-25 of us gathered in the schoolroom, fidgeting, joking nervously, jovially eyeing the competition. Lining up our papers and pencils. "Les vieilles femmes qui avaient eu la lourde responsabilité d’habiller la jeune fille pour son repos éternel avaient scrupuleusement respecté les coutumes mortuaires. Une icône de la vierge était placé sur sa poitrine, bien calée entre ses bras en croix. Au-dessus de sa tête, un petit miroir devait chasser les démons tentés de s’approcher du cadavre..."
...and on to the the end of a long passage. Then, sentence by sentence, she repeated the passage*, and we scribbled ferociously. One more time all the way through. But I could hardly bear to look at what I'd written: I knew I'd start second-guessing myself and thus had to rely mostly on first impulse. A quick review for egregious errors and I flipped it over. Done. Palms a little sweaty and the pencil worn down. Then we swapped our dictées with our neighbors, corrected the dictée per the passage projected on the large screen at the front of the class. I thought I had done pretty well, but couldn't remember if I'd flubbed a few accents. Muriel gathered the corrected the dictées and announced the results. First place, with 1 mistake: Polly. I was both thrilled and supremely embarrassed. Can't explain it: I didn't anticipate that reaction because I didn't anticipate winning. At the awards ceremony, I got a book, a certificate, and congratulatory cheek bisous from Corinne Pereira, the French Deputy Consul General. But the biggest prize was rising to a personal challenge. So, mes amis, on days when I think my foggy boomer-brain has turned to mush, I can at least pat myself on the back reassuringly and say, "Ah, but Polly, you sure do great accents aigus." * passage by Romanian author Liliana Lazar, I found out afterwards. St. Patrick's Day, and even Paris is going green. 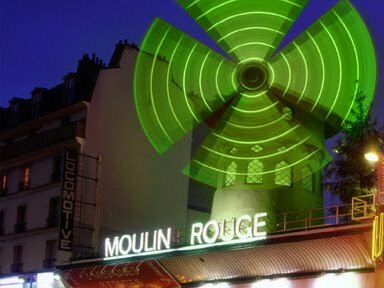 Yes, the famed Moulin Rouge, for the next two days, will be the Moulin Vert. 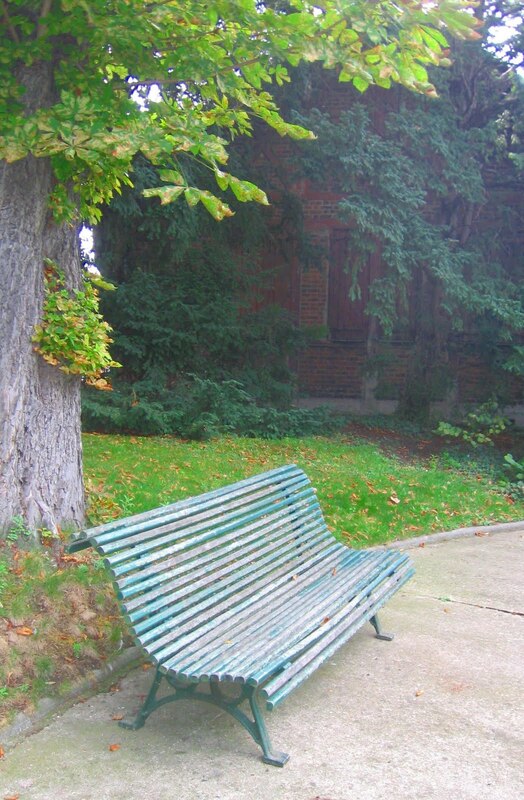 But I like to reflect on some of the other greened spaces in Paris. 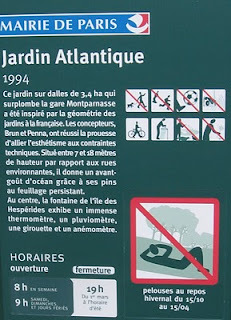 The Jardin Atlantique is a favorite example: a space created above the steelyard of train tracks outside the Gare Montparnasse in 1994, which has been converted to a green-space for all to enjoy. Plants, trees, and outdoor spaces, all at the doorstep of a major train station. Ah, a fine sampling of lush green grass to enjoy at le Jardin Atlantique while waiting for the TGV... er, when it is not the season of pelouses interdites. 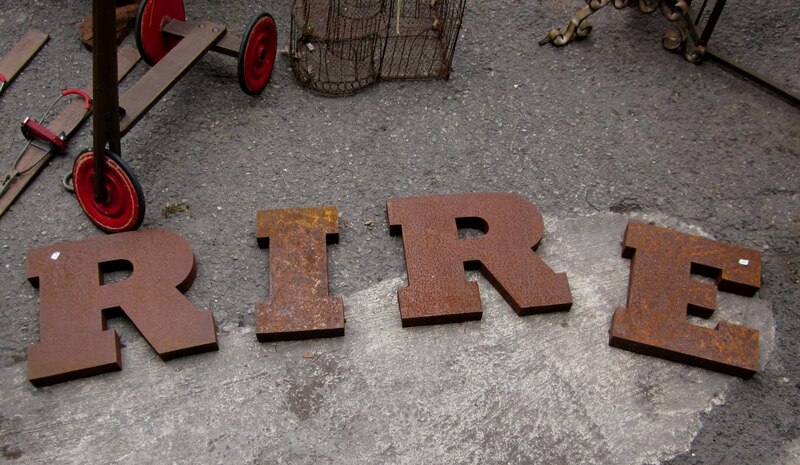 I loved this witty display of antique advertising lettering at an antiquaire in l'Isle-sur-la-Sorgue. 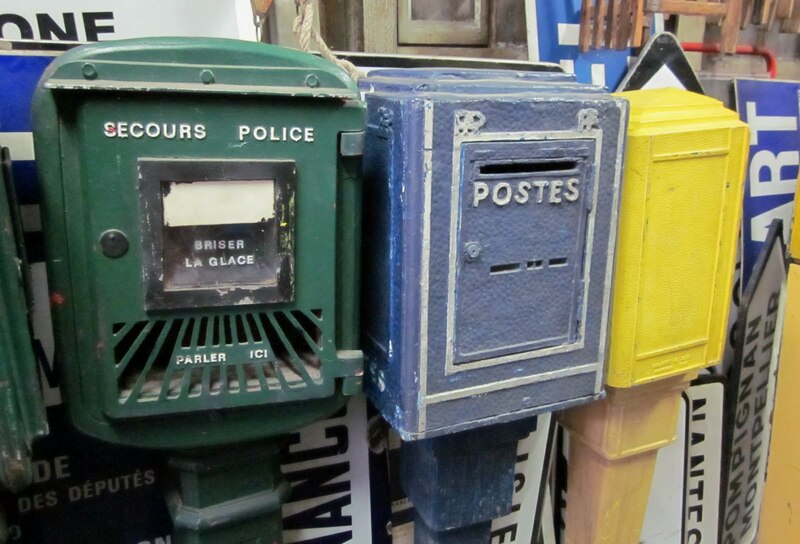 Fabulous antiques mecca in the south of France. It successfully produced one of two desired effects: made me laugh. Alas, didn't make me buy. Suitcase constraints. For the uninitiated, let me just say that it is the highest of high-end orfèvrerie (goldsmith/silversmith) with an unparalleled Parisian pedigree. For the cognoscenti, it is, of course, the home of “le sein de Pauline,” a.k.a. Pauline’s breast. 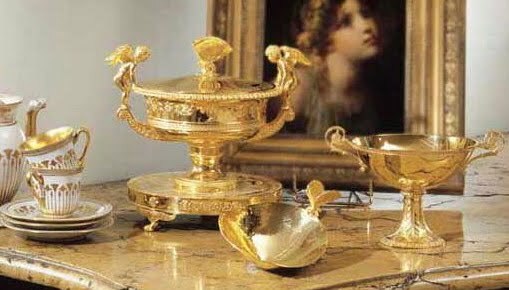 Yes, chez Odiot you can purchase for your little coffee table a charming bibelot – a gold cup molded from the breast of Napoleon’s sister Pauline Borghese. Sometimes the “sein de Pauline” is featured in Odiot’s glam-but-chicly-restrained store window. Other times you’ll simply have to stop in and ask to see it. Spoiled moi, my first apartment in Paris was six storeys up on place de la Madeleine, whence I could gaze down on the Odiot shop window. And press my nose against the Odiot vitrine in a trance as I gawked at the shiny splendor inside. I had no choice but to pass by Odiot every time I left the apartment; and, trust me, I was never disappointed. Somehow there is something comforting in viewing sheer lavishness, just knowing that it exists because it is a fine art. 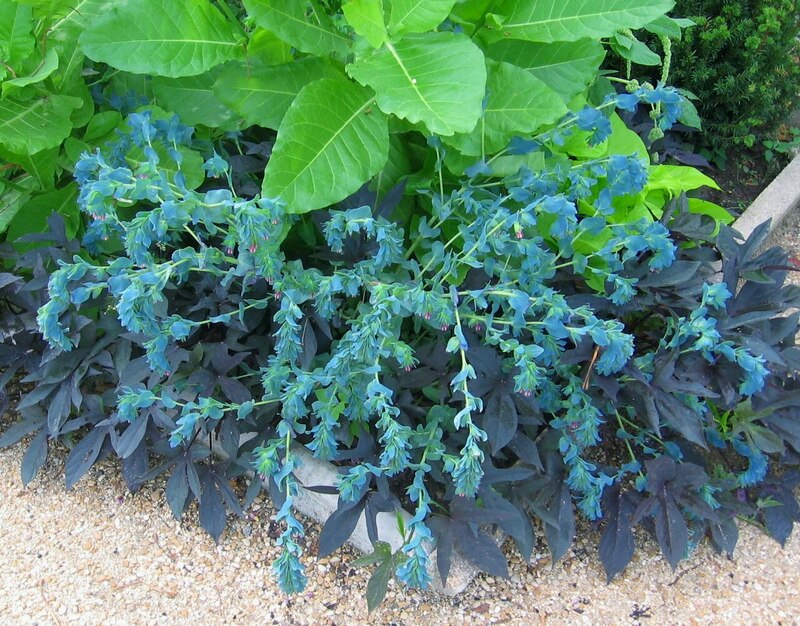 And, curiously, the coveting diminishes as the appreciation increases. It was like walking past a museum display. Ah, the days of my daily Odiot fix! 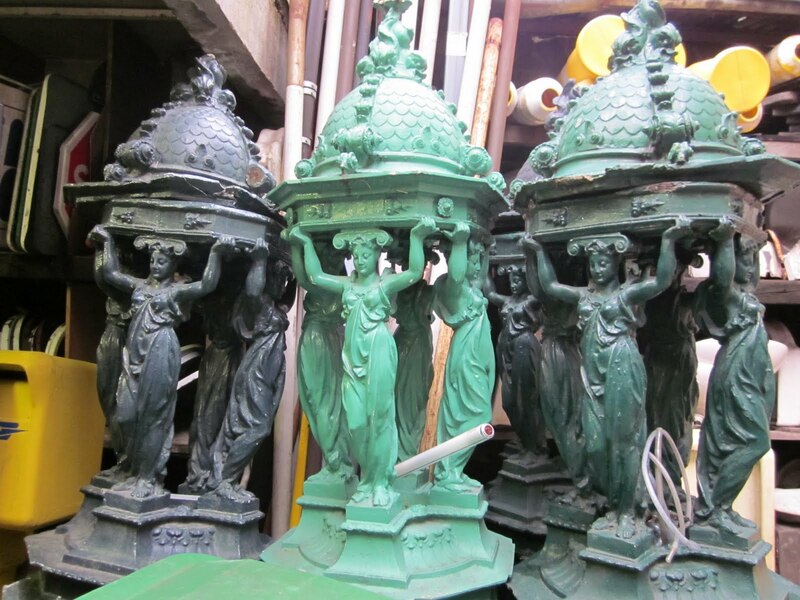 Do yourself a favor and stop by the storefront of Odiot for a great view of gilded Parisian splendor. Enter and look at the incredible offerings. But consider yourself forewarned! Odiot is powerfully appealing. You start nosing around for the least expensive item, just to be able to take something home. Like a breast of Pauline with a cute little butterfly. Your Valentine's Name in Lights in Paris! Details [in French] are here.